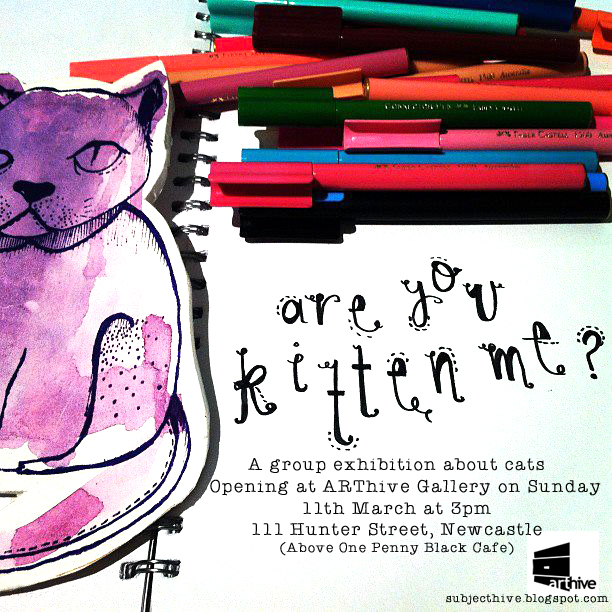 We have a group of amazing artists from a variety of disciplines exhibiting- things are shaping up to be just purrrrrrfect! Featured artists include Eddie Botha, Kirrily Humphries, Alisha Hinds, Amanda Reeves, Sarah Mould, Jessica Louttit, Grant Hunter, Daniel Smith, Angus Arley Crowley, Bryce Collins, Ry Wilkin, and Effie Dee. Come to the gallery at 3pm Sunday March 11th to share some kitten cake and enjoy the delightful music of exhibiting artist, Lizzie Nagy as Young Lions! MEOW! Ps. Those who dress in leopard/jaguar/cheetah/cat prints shall be rewarded!